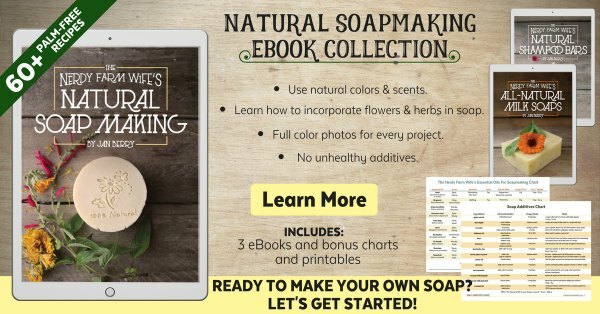 Multiple readers asked for mild unscented soap and homemade lotion recipes that are extra gentle and can be made especially for loved ones that are going through cancer treatments. Since cancer treatments often cause skin to become more sensitive and fragile, it’s usually recommended that patients use mild products without fragrance, colorants, or exfoliants. 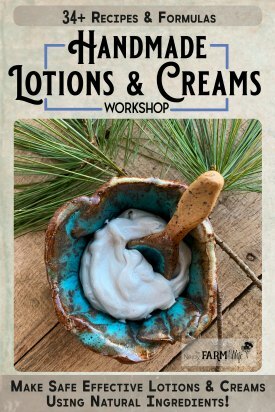 In this blog post, I’ll cover a few soap recipe ideas and in the next article, I have two lotion recipes to share. 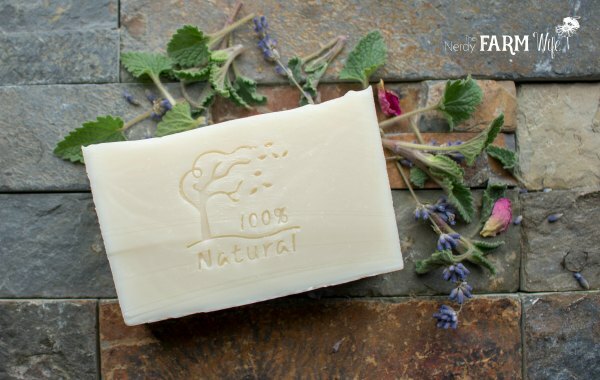 This soap has a mild creamy lather that won’t leave your skin feeling tight or dry. Aloe liquid (like this kind) adds an extra soothing element to the recipe, but if you don’t have any, you can use distilled water instead. You could also use milk in its place; see How to Make Soap With Milk for information on how to do that. This recipe can also be found on page 33 of my Simple & Natural Soapmaking print book. This skin nourishing soap contains a high amount of olive oil, plus shea butter for its fantastic ability to condition and moisturize skin, along with castor oil to help boost lather. As with the recipe above, you could also use aloe liquid or milk in place of the water. If shea butter isn’t available, you can substitute with mango butter, cocoa butter, lard or tallow. The lye amount will still fall within an acceptable range and will not need to be changed. Information on the soap mold I used can be found in my 15+ Pretty Silicone Molds for Making Handmade Soap article. Wearing protective gloves and eyewear, carefully stir the lye into the aloe or distilled water. Avoid breathing in the temporary strong fumes. Set the lye solution aside in safe place to cool to around 100 to 110 degrees F (38 to 43 degrees C). Melt the solid oils and fats. Mix the melted oils/fats with the other liquid oils in the recipe. Pour the cooled lye solution into the warmed oils. 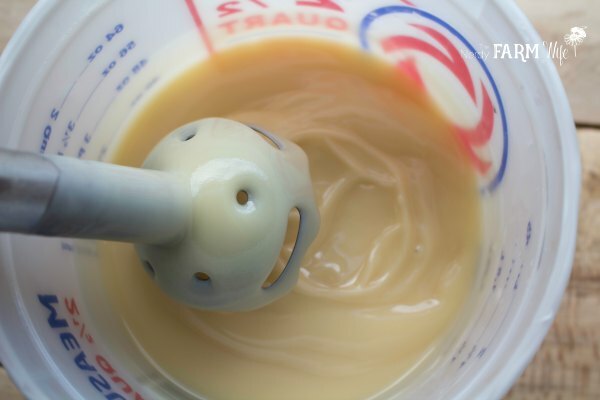 Using a combination of hand-stirring and an immersion blender, stir the soap until it reaches trace*. Pour the soap into the mold and cover lightly with a towel or blanket. Keep the soap in the mold for about 2 days or until it releases easily. Slice into bars and cure in the open air for at least 4 weeks before use. Soaps higher in olive oil, like the bastille soap, will improve as they age, so benefit even more from a 3+ month cure time. 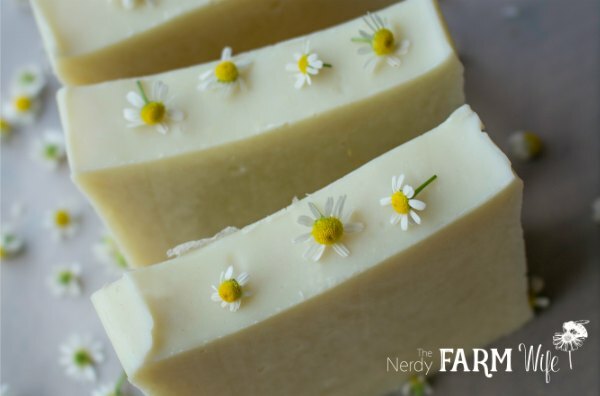 Chamomile “Almost” Castile Soap – This recipe contains just two oils – olive and castor. You can omit the chamomile for a completely unscented soap. 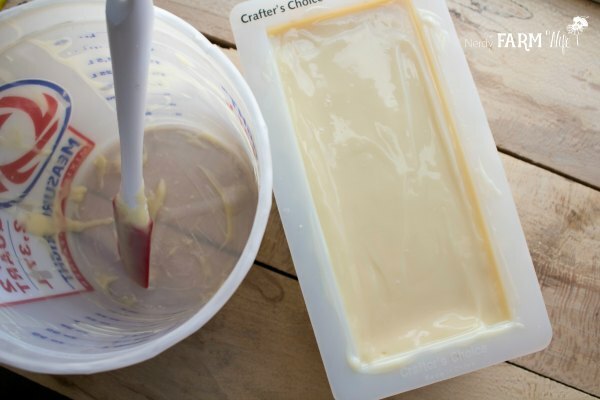 Oatmeal Honey Soap – This easy recipe is made in a crockpot so that it’s ready to use sooner. Omit the lavender essential oil so that it will be unscented. 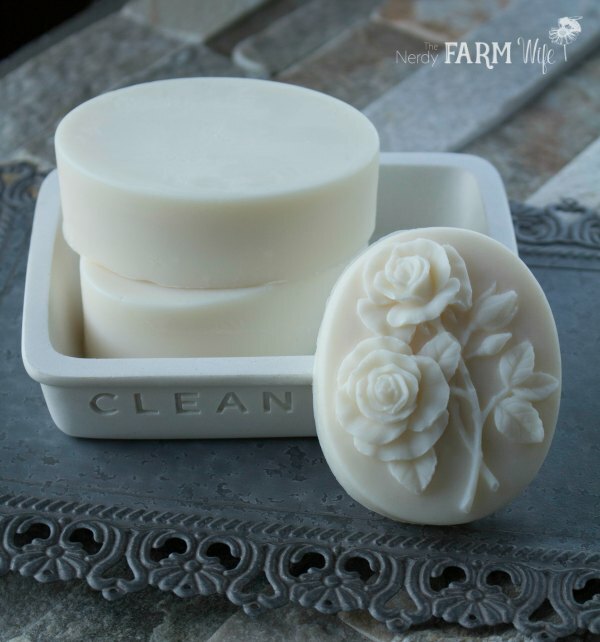 Basic Soap Recipe – You can find this simple soap recipe in my article on How to Create Custom Soaps. If you enjoyed this article, let’s keep in touch! 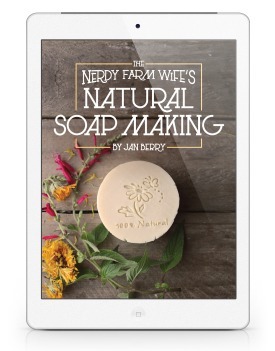 Subscribe to my newsletter to receive my best soapmaking tutorials, DIY body care recipes and fun projects you can make with common flowers and herbs that grow right around you. Tagged sensitive skin, unscented. Bookmark the permalink. Thanks for the mild unscented soap recipes Jan. I will be making your Creamy Shea Butter recipe next. Wonderful. The Nerdy Farm Wife is still my favorate website. Keep up the wonderful posts and emails Jan, I look forward to them. I am enjoying your posts & recipes. I have made two other recipes from two other sites but they are not the correct ones I want. Theres nothing wrong with them but its not what I’m looking for. This recipe is completely different & I’m looking forward to making it. Hi! I enjoy your recipes so much! Would you please add a print option to these? Thank you! Sorry for being so vague, just the recipe. Without the pics. Thanks! To print the recipe without photos, scroll down until you see a green “Print Friendly” button. When you click on that, it will bring up the whole page, including photos. Thank you for the fantastic work! I’m new to soap making and live in Uganda where I do not have access to true olive oil (it’s mostly adulterated). What other oil can I substitute for olive oil? Is aloe liquid just aloe vera? Like the kind of gel like stuff or is this thinner? Thanks. Hi Danielle! Aloe vera liquid is just like the gel, only it’s thinner because it doesn’t have added gums & thickeners to turn it gel-like. However, I’ve had several people let me know that they’ve used diluted aloe vera gel in my recipes instead of the liquid & every one of them said the soap turned out great! I made your Shea butter Castile soap and gave one to a customer of mine who is a nurse. She called back and said she LOVED it! It was like using lotion on her skin it was so lovely. Thanks for all of your great recipes! Thank you for all the recipes. I’ve tried many of them, and they are all great to me. I’ve tried this extra gentle soap (with water) and love the texture. I am going to try 50% aloe gel and 50% water next. Thank you again! How many bars does this make? I’m using the recipe for a school project and can only make one bar. Hi December! If you make it in a loaf mold, it makes about 7 or 8 bars. You’d need to really reduce the recipe down to make just one bar – probably by around 1/8 of the amounts given. Good luck with your school project! Thanks San! Happy to hear you’re enjoying the site! :) Most of my soap recipes are superfatted at 6%, except for soaps made with milk, tallow/lard, which are more likely to be 5%. Is that 5.4 oz or 5.0 oz coconut oil? Thanks.